She was throwing him a surprise party with Jimmy Buffett Cheeseburger in Paradise theme. She thought it would be cute to have these hamburger cupcakes. But she didn’t want them to have brownie in the middle because she loves my vanilla cupcakes and buttercream. She thought the brownie would take over the simple taste and I agreed with her. So asked if I would make the cupcakes for her since she didn’t have time and didn’t think she could make them look like she wanted. I said I would help out and make them for her. I decided to help her out and make them for her. The result was super cute so I knew I had to share them here. They would have been awesome with some sugar cookie fries like Bakerella made. Make the cupcakes according to the box except put in 3 whole eggs rather than the egg whites only. I find that the egg yolks don’t change the color of the batter and that the cake is far more moist with them in. I made one box at a time since I can only cook 24 cupcakes at a time anyhow. 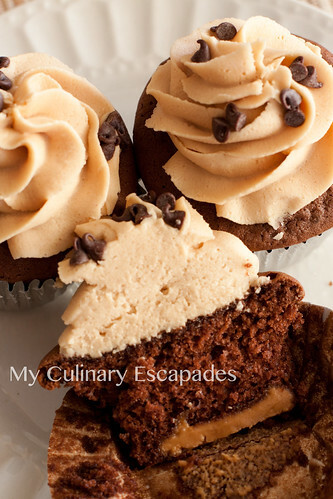 Make both batches of cupcakes and allow to cool on rack. Make third box of cake mix like you did the cupcakes but this time you need to add food coloring. I used black food coloring and I know if I was going to do it again I would try brown next time. I added A LOT of black food coloring and the mix was kind of dark grayish purple. I didn’t have another cake mix to start over so I baked it and hoped it would bake up darker. Spray a jelly roll pan with Baking Pam. If you have never used this product before I highly suggest it. No more greasing and flouring a pan, just spray and ready to go. I have never had anything stick when using it. Spread the colored cake mix into the jelly roll pan and bake for 15 minutes or until it springs back when you touch it and a toothpick inserted comes out clean. Allow colored cake to cool completely. In a saucepan combine the sugar and water and cook until sugar is dissolved. 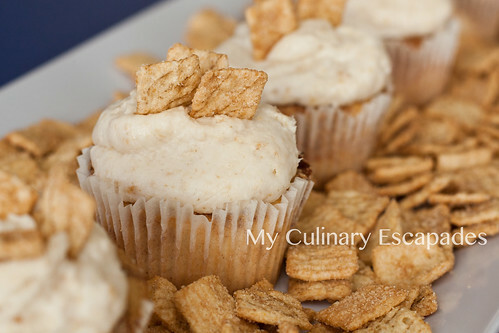 Using a pastry brush brush the simple sugar over the cupcakes and sprinkle lightly with sesame seeds. Allow to dry for about an hour. DO NOT cover the cupcakes at this point or they will get ooey and gooey. The simple sugar needs to adhere the sesame seeds but not make them overly moist. 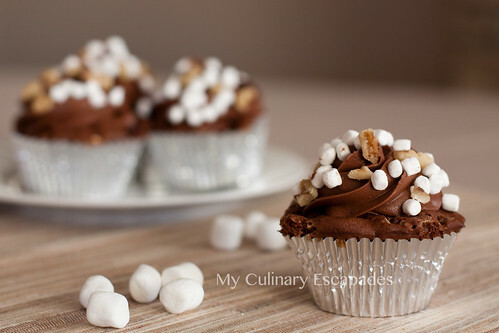 Once simple sugar has dried remove the liners from the cupcakes and slice in half like a hamburger bun. Using a round cutter begin cutting your colored cake into rounds, these will be the hamburgers. I love my Ateco Double Sided Cutters and was able to choose the perfect size to make the hamburger patties. Now it is time to make the icing. Cream the butter and shortening together until well combined. Add the powdered sugar until it is well mixed. Add the vanilla, salt and milk until the desired consistency is achieved. Split the icing into three bowls. One with about half the icing and the other two with about one quarter of the icing each. Add green food coloring to the largest amount of icing and red and yellow to the other two. Once well mixed put the icing into piping bags. For the green icing I used tip 104, for the red and yellow I used tip 7. Take top off of bun and place a dot of yellow icing in the center (this shouldn’t be seen it is just to secure the hamburger patty). Place hamburger patty on top and then pipe two to three dots of yellow mustard near the edges. It is fine if it slops down the side a little, most good hamburgers do. Make a line of red icing along one side and a dot in between the yellow ones. 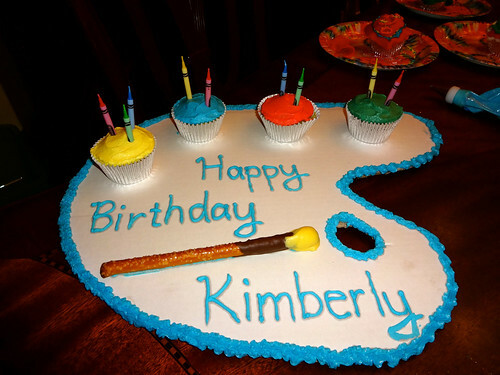 Using the green icing pipe a wiggly line of “lettuce” around the edges. Add the top and admire how cute the mini sweet hamburger is. 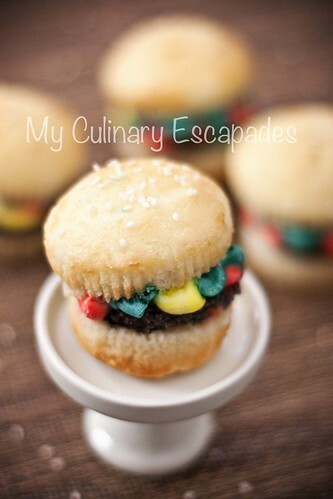 This recipe makes 48 hamburger cupcakes.